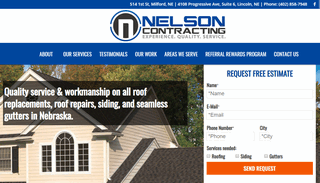 Nelson Contracting LLC is a general contractor located in Lincoln, Nebraska. Our services include roofing, siding, gutters, windows & doors. When you need an honest and reliable roofing contractor in Lincoln, NE or the surrounding area give us a call. We provide free inspections and quotes for all services. Our professional contractors have the experience and dependability you are looking for. Established in 1998, Toby and Aaron Nelson have been working together on roofing since they learned to roof in the late 80's and have kept at it ever since. They are committed to keeping each job site in tip-top shape during the construction process, using the New Roof, No Mess approach detailed on their website.They look forward to helping you with all of your exterior construction needs!